This story began as a report of a one-off case of potential predatory practice last month, and has escalated to an official call to disband an entire international editorial board, and an accusation against the editor of mass-scale nepotism and other publishing misconduct. The journal, Archives of Biological Sciences (ABS) is the official publication of the Serbian Biological Society, co-published by ten organisations in Serbia and Bosnia. It was accused (on June 12) on the Scholarly Open Access blog of accepting a paper in 24 hours with no peer review, and demanding 1785 euros for publishing it. After receiving a quick acceptance letter for his plant sciences paper, Jaime A. Teixeira da Silva, an outspoken critic of what he considers corruption in scientific publishing, said he was “extremely concerned” and demanded “a full explanation of the predatory publication charges” in an e-mail to the editor. But the Centre for Evaluation in Education and Science (CEON/CEES), which runs the Serbian national citation index in cooperation with the National Library of Serbia, started its own investigation. Now, they have issued preliminary findings, calling for the entire editorial board and the editor to go, and for the Serbian Ministry of Science to suspend the journal and deny it funding for at least two years. According to Serbian media, the editor has now resigned, as did the management board of the Serbian Biological Society. “The editor has systematically published in ABS an unacceptably large number of articles of his own and articles of the two members of his immediate family, a son and a daughter. Only in 2013 and in 2014 they jointly or in collaboration with other authors published in ABS between 3 and 5 papers per issue. In ABS, we found numerous evidences of manipulative citation behaviour, aimed at boosting the impact artificially. Even a quarter of citations that ABS obtained in WoS in 2013 stems from the papers of the Editor and his family, which contributed to the ABS Impact Factor almost as much as all other Serbian authors together. In ten of his WoS articles the Editor cited his journal more than 10 times per paper. ABS self-citation rate in WoS at the author level is far greater than of any other Serbian WoS journal. The accumulation of ‘fresh’ citations, ie. those aged up to two years (the only ones to be taken into account when calculating Impact Factor) is highly atypical compared to other journals in Biology, the group it belongs to. In only four years Impact Factor of ABS increased from 0.238 to 0.791, although the number of papers in roughly the same period almost doubled. ABS does not implement preventive measures against plagiarism, although there is a strong need for that. In our 2010 study, dedicated only to this problem, we detected in ABS 4 plagiarized and 12 self-plagiarized articles, of which at least two were of grave scale. This was more than in any other journal under study. For this we provided the Editorial Board of ABS (as well as the Ministry) conclusive evidence, but the Board ignored our invitation to take appropriate action and kept the practice of tolerance for plagiarism. Now, by means of the appropriate software (iThenticate) we have registered only in the ABS 2013 volume as much as 21 papers that in a valid procedure must be declared plagiarised, as well as 10 papers that would have to be qualified as self-plagiarized. ABS resorts to subtle forms of marketing that are typical of the so-called predatory behaviour. Among others, with reference to payment of fees (donations, sic) authors are informed that their papers will be published in Online First regime, although such option is not supported. Based on these and other findings, we estimated that violation of international publishing standards in the ABS assumed such proportions that the continuation of its indexing compromises the legitimacy of the use of SCIndeks for evaluation purposes. Along with the notice about the decision, we called for the Ministry as regulatory and at the same time financing institution to: temporarily withhold ABS the status of a scientific journal, i.e. to suppress it from the list of categorized journals until correction of all deficiencies, but not for the shorter period than two years; deny ABS funding for at least one year; and call for the ABS publishers to urgently dismiss the Editorial Board and the Editor-In-Chief, and to promptly inform the Thomson Reuters, the publisher of WoS/JCR, about the reasons for the dismissal in order to prevent sanctions against ABS. We’ve contacted the journal editor, and will update this post if we hear back. Great work to everyone involved in muzzling this predatory journal. Yes, don’t mess with Jaime. Jaime Teixeira, known in this blog as a prolific commentator, deserves thunderous applause for its involvement in the case. Perhaps to your surprise, there is one journal that I believe is many, many fold worse, highly non-academic in my opinion: Acta Horticulturae, published by the International Society for Horticultural Science (http://actahort.org/). That is my next target. An it is a monster with over 7500 members globally. I am struggling to achieve tangble results because, unlike Archives of Biological Sciences, which could be controlled by a higher power, namely the ministry of education of Serbia, in te case of the ISHS, it is the ISHS that calls all the shots, driven by a highly profitable business venture. Jozef Van Assche is a key player (http://www.ishs.org/ishs-board). So far, I have found what I claim are four clear cases of duplication, but only two have been retracted, and even so, only after formidable pressure and exposure. Otherwise, there is ZERO apetite to clean that hornest’s nest. The mangement of the ISHS, which has links to the Editor board of the Elsevier journal I was banned from for being so critical, Scientia Horticulturae, specifically the current (2010-2014) President, Professor Antonio Monteiro, and the manager for publications, Prof. Yves Desjardins, resist correcting their journal, despite claiming publically otherwise, and I claim that the ISHS is making profit off bad and stained science. The ISHS’s centennial celebration is coming up soon: http://www.ihc2014.org/. This will be my target audience to cause a revolt in the plant sciences, specifically in the horticultural sciences. It is time to stand up to Goliath (at least one of them). I am willing to sacrifice my name and my career for this. I did not become a scientists, spent several decades preparing and fighting for something which clearly has become something it was not originally perceived to be. I make my first public claim of WAR (in an academic sense) against the ISHS, which will potentially involve many of my colleagues who will then be forced to take sides: either side with or against academic integrity and open, honest and transparent change and disclosure. I can appreciate that not all (in fact most likely only a centisimal of a fraction) scientists would be able or willing to sacrifice everything in the name of science, but precisely yesterday I made that decision. I will fight them all until I have no strength left in my body. People only now have recognized my fight, now that I have finally been able to see the total collapse of one journal, but I assure you that I have been battling several dozen publishers and many more journals for their dishonest practices, some small, some large. But now it is time, using my limited financial resurces and technical skills, to expose everything I know and everything I think. RW is a great place to do this, and to use as a sand-box for testing my ideas and seeing the response of others. When exposing problems anonymously, one can breathe at the end of the day as one sees the complaint take effect, or die out. But when one uses one’s full name, as I have done, it is a very painful process, because everything becomes sacrificed. It is the so-called point of no return. I confirm that this statement was written by me, particularly the public declaration of academic war against the ISH’s fraudulent Acta Horticulturae. I would be very grateful if you could take a few minutes from your busy schedule to read through this e-mail, which reflects my sincerest and deepest concerns about what I perceive to be serious problems with the ISHS’s relative lack of accountability, and aspects of dishonest academic behavior related to its key publication, Acta Horticulturae. This is particularly important since the ISHS, at the IHC2014, will boast over 1600 posters and oral presentations, many of which will finally make their way into the pages of Acta Horticulturae. The reason why I am contacting you is that you are one of the distinct members of the global horticultural community, and part of a highly select privileged few, who will be taking the stage in Australia in a few days’ time to address other colleagues from around the world in 52 symposia (http://www.ihc2014.org/scientific_program.html#symposia). I thus wanted to bring these cases and issues to your attention just before the meeting with one hope: that you would use your position and possibly power of persuasion to convince the ISHS management (http://www.ishs.org/ishs-board) that radical and immediate change and reform is required. The timing is important as it will allow you to reflect about these facts and these serous issues a few days before you undertake your official duties at the IHC2014. The IHC2014 in Australia should thus not only be a time for celebration, it should be a time for deep concern, and a period of inward reflection with a view to finding a long-term solution as to how to correct the faults present in Acta Horticulturae. Between June and October 2013, while compiling literature related to chrysanthemum, I stumbled across several papers by Tom Eeckhaut and Johan Van Huylenbroeck, two highly respected global leaders of ornamental science. After requesting a reprint of their Acta Horticulturae paper, it quickly became apparent that one of them was a duplicate publication of a Springer Science + Business Medium paper published in Acta Physiologiae Plantarum. As you are undoubtedly well aware, duplicate publications are amongst the most serious academic offenses in science publishing and underscore the integrity of the literature. Concerned by this discovery, I immediately contacted the ISHS management, which includes Prof. Antonio A. Monteiro, the President of the ISHS (2010-2014; Portugal), the vice-president of the ISHS, Dr. Kim Hummer (USA), the treasurer, Prof. Georg Noga (Germany), the publications manager, Prof. Yves Desjardins (Canada), the Secretary responsible for innovation, industry and insight, Prof. Errol W. Hewett (New Zealand), the co-president of the ISHS XXIX IHC, Prof. I.J. Warrington (New Zealand), and the executive director ISHS secretariat, Ir. Jozef Van Assche (Belgium). Without exception, all actively ignored my requests to correct the literature and to retract the duplicate publication from Acta Horticulturae, or actively attempted to downplay my concerns. After several frustrating months of fruitless efforts to get the ISHS and these 7 ISHS elite to correct the literature, I decide to take my concerns public, and posted a list of papers in the chrysanthemum literature that contained serous academic offenses, including duplication, plagiarism, etc., including the duplication by Eeckhaut and Van Huylenbroeck . My public disclosures took place between January and February 2014. The objective was only one: to ensure that the literature be corrected to reflect the errors and to remove unscholarly papers, or academic offenses. In a sudden flurry to reduce collateral damage, and under great pressure, Van Huylenbroeck requested Acta Horticulturae to retract the paper, which was achieved within the space of a few days . In addition, in a desperate attempt to suddenly save face of the ISHS in the light of this high-profile scandal, Prof. Yves Desjardins made a public promise to retract a second duplication on Vitis genetic transformation by another high-profile group of Japanese horticultural scientists (Yoichiro Hoshino, Yan-Ming Zhu, Masaru Nakano, Eikichi Takahashi, Masahiro Mii) . Despite those promises, and despite the promises made by the Japanese authors and the ISHS to immediately retract this duplicate paper from Acta Horticulturae, the paper still exists, intact, leaving the plant science literature corrupted. This is fundamentally wrong at several levels, least of which is the corporate irresponsibility demonstrated by the ISHS management in the light of reports of academic problems or irregularities in Acta Horticulturae. Separately, having discovered serious incongruences in the authorship definition of Elsevier Ltd. and one of the world’s top horticultural journals, Scientia Horticulturae, I took the story public. My concerns were allayed to the entire Scientia Horticulturae board, which included Prof. Antonio Monteiro, the current President of the ISHS, as well as individuals such as Samir Debnath and Dietmar Schwarz, who not only serve the editor board of Scientia Horticulturae as co-Editors-in-Chief, but who are deeply involved in, as ISHS members, multiple ISHS symposia, including at IHC2014. This revolving door of power, and its potential abuse, undermines trust in horticulture and plant science. All requests to Debnath for reprints of several of his papers, including in Acta Horticulturae, have never been met, reflecting further the absolutely irresponsible behavior by this individual and the other editors and members of the community that support him even though they are fully aware of these issues. This indicates that, even in the light of public criticism and exposure of factual errors, the wider horticultural community is actively turning a blind eye. This, too, I believe, is problematic. In a swift move to silence my voice of criticism about the lack of academic quality control measures that appear to overlap in Acta Horticulturae and Scientia Horticulturae, I was aggressively banned from the latter journal . Yet, after my public revelations about that journal, no less than 12 editors were suddenly removed and 8 new ones introduced within the space of one month. No public explanation at all, no apology to the horticultural community, not a single word of explanation. One of those revelations was the serious duplications of data, figures and tables by Gregory Welbaum and David Tay, bith of Virginia Tech (USA), in Acta Horticulturae and Scientia Horticulturae . Gregory Welbaum was an editor of Scientia Horticulturae and also a prominent supporter of the ISHS. Requests for action against this academic offense by Welbaum and Tay were totally ignored by Virginia Tech, who appears to have sought, through silence, to protect the image of these scientists and their institute, rather than seeking to correct the literature and remove this serious case of data duplication. I and other scientists started to realize that the plant science literature, including horticulture, appears to be riddled with potentially dozens or even hundreds of papers that contain serious scientific flaws, academic fraud, duplications, or (self)-plagiarism . Yet, very little is being done by the plant science community to correct these errors, except where high-profile journals are suddenly placed under the spot-light. There appears to be a wide and blind attitude towards this academic fraud, even after officially reported. This is particularly true of the ISHS management with respect to academic problems in Acta Horticulturae. I believe that the situation in Acta Horticulturae is serious. There are potentially dozens (if not hundreds) of papers in the >56,000 published papers in 1040 volumes that contain (self-)plagiarism, bad science, or duplications (partial or full). Yet, the ISHS management is actively trying to silence my revelations about these serious problems. a) A full replacement of the current ISHS management with individuals who understand, and practice, strict academic integrity. Such individuals should not only make promises, they should be held fully accountable for those promises, which they should keep. b) The implementation of a new program of academic integrity which will involve the appointment of a special team of specialists, academics and IT specialists, to screen all >56,000 papers already published in Acta Horticulturae. Surely, from the substantial coffers of the ISHS, a certain percentage should be employed for ensuring academic integrity and for screening all past literature and correcting the literature, where necessary? c) This analysis of all Acta Horticulturae papers from Volume 1 to 1040 is basically a post-publication peer review  that has its core objectives to identify duplicated data, duplicated papers, duplicated figures, graphs or tables, plagiarism and self-plagiarism, all of which represent a serious academic offense. The continued existence of such papers undermines the academic integrity of Acta Horticulturae and the ISHS. d) In order for the wider scientific community to evaluate possible academic fraud, misconduct and errors / problems in an independent and transparent manner, ALL Acta Horticulturae content, from volume 1 to volume 1040+ (http://www.ishs.org/acta-horticulturae) should be made open access. This would allow any member of the global horticultural community to revise, screen and advise the new academic integrity body of any problems that need to be addressed, ether as errata, corrigenda, or retractions. e) All retractions (past or future) should be clearly indicated, and the retracted paper should be left published as an open access PDF file with the word RETRACTED stamped clearly, in red, for posterity to understand the errors . f) A clear time-line by which any reported case will be handled, an indication of who is the person responsible for the retraction, and what actions will be taken to publicize the error or fraud, including contacting the member research institutes, scholarly societies like COPE, and other horticultural and plant science-related entities like the ASHS, Elsevier, Springer and other main-stream publishers that publish horticulture-related journals. This is because such problematic papers can have downstream effects, such as being (unfairly) referenced in other papers. Thus, papers that reference faulty Acta Horticulturae papers should be corrected, as well. g) An immediate cessation of for-profit sales of PDF files and “subscriptions” to Acta Horticulturae papers (http://www.ishs.org/subscriptions), exceeding in some cases 5000 EUROS/year, which could potentially be an act of fraud, since claims of sales of academically, rigorously peer reviewed content with academic integrity, is clearly false. Such sales should be immediately and indefinitely terminated until the entire Acta Horticulturae literature has been fully examined in detail as indicated in b) and c) above. h) A pro-active attempt to remove protectionism, favoritism, conflicts of interest and nepotism not only from the ISHS and its high-level “contacts” around the world, but also from related journals and publishers in the commercial main-stream of plant science publishing. Nepotism distorts the balance of academia and favors some above others. This is clearly evident in some of the individuals linked to both Acta Horticulturae and Scientia Horticuiturae, as one example. i) The call for horticultural scientists to abandon ISHS membership and stop attending their meetings, until full reform has taken place. In other words, a call for the public boycott of the ISHS, its meetings and its activities, including the support of Acta Horticulturae, until the other (a-h) conditions are fully met and until trust in the honesty and academic integrity of Acta Horticulturae is reinstated. The entire global horticultural community should demand no less than these 9 conditions. Finally, another case of silence by the ISHS and The Hebrew University of Jerusalem that involves two Acta Horticulturae papers by Prof. Abraham H. Halevy, who is now deceased [6: see comment dated July 26, 2014]. This case indicates the risks of the elite in horticultural science actively protecting their own selfish interests, their institutional name and apparently the reputation of already deceased colleagues, while, without any responsibility towards the scientific literature, are sacrificing the integrity of science and science publishing. This level of irresponsibility must stop. In your privileged position, as one of the key members of the IHC2014, I am frankly requesting that you recognize these serious flaws in the ISHS. Ideally, it would be important to get the formal compromise of the 7 ISHS management members to draft and sign a formal declaration that takes into account aspects a-I listed above that would reinstate reform and ensure the short-term revision of the 56,000+ Acta Horticulturae papers already published. I believe that such a memorandum should emerge before the end of the IHC2014. In that sense, now that you are cognizant of these problems, the horticultural community requests you to ensure that the ISHS management are held fully accountable. In closing, I should add that a limited window of Acta Horticulturae, dating from about 2001-2004, which was freely available online for a certain period of time, is being analyzed in detail. I can indicate, without yet providing public details (these will be released post IHC2014), that there are serious problems (academic, scientific, duplications, plagiarism, etc.) with papers by very highly respected individuals, some of whom are serving on the boards of symposia at IHC2014, plenary speakers and/or key-note speakers. It could be extremely embarrassing for such individuals if academic accountability is not taken immediately by the ISHS and IHC2014 before August 25, when the IHC2014 is expected to finish. I look forward to hearing from you and to learning that a memorandum and publically visible document has been signed that will examine, in detail, the 56,000+ Acta Horticulturae papers, correct the literature and enforce other essential reforms at the ISHS. A copy has been sent to RW, who would be wise, as science journalists, to contact the ISHS executive for comment following the public posting of this letter because I am of the belief that there are likely to be mass retractions from Acta Horticulturae if in-depth analyses of the 56,000+ papers take place, as I propose. Step 3: Considering that the ISHS is selling papers from this journal with clear academic problems (http://www.ishs.org/subscriptions and http://www.ishs.org/ishs-membership-categories), this would seem to me like a supermarket selling rotten fruit. The principle is identical, how can this “academic” society, which is failing to take responsibility for its core publication, charging so much money for access to many (currently unquantifiable) problematic papers? Consequently, it was important to also give a heads up to the IHC2014 sponsors (http://ihc2014.org/sponsorship.html), because they are likely to understand the financial repurcussions of my claims, and allow for a “fruitful” discussion to emerge, hopefully, at IHC2014. How common is nepotism , cronyism and favoritism in science publishing? I am surprised that you already removed ABS from your list. If my info encouraged your decision, this was not my intention. I appreciate and share your stance that ABS led by the new Editorial Board deserves new chance. However, there is “no new editor and new editorial board”. We will continue to make the pressure, but there is no guarantee that the present Editorial board will resign or be dismissed. To my present knowledge professor Curcic is still fighting furiously to keep his position. I am extremely concerned that, under this circumstances, the fact that ABS was removed from your list will be interpreted by him and his cronies as a proof that there were no irregularities in ABS editing and that “all this was a revenge of individuals and a vain scientists from Portugal”, which was his explanation to the media. I am afraid that Dr. Silva, in his latest message, is 100% right in other aspects of this case as well. Is there any way that you withdraw your decision? The time will come soon, hopefully this autumn at the latest, that the co-publishers of ABS who are not willing to tolerate the journal’s present editorial practice do their job and made the situation for you clear enough to make your final decision. I sincerely hope that this decision will be based on the new Editor´s decision to condemn practices of previous Editor, to apologize to the authors who were victimized in any way, and to re-review of all papers accepted in an irregular way, to say the least. Finally, I maintain the following: I know alot of highly respected plant scientists from Serbia, amny of whom have secretly sided with my actions to expose this, and thus the “attack” is not on Serbia, it is on academic misconduct. It is important to maintain this distinction. a new President of the Society. At the outset, I wish to thank you for copying me on your message to Thomson Reuters and to Jeffrey Beall. I consider this to be a very positive development for ABS and a hopeful sign for Serbian science and research. I wish you well in your new positions and hope that you are ready to take on the complex challenges that science publishing entails nowadays. However, before entering any celebratory mood, I have some lingering concerns and questions about ABS. I would be grateful if you could please provide a formal response to these queries, and then also copy that statement publically, at Retraction Watch (http://retractionwatch.com/2014/07/07/serbian-journal-lands-in-hot-water-after-challenge-on-24-hour-peer-review-that-cost-1785-euros/) and Beall’s blog (http://scholarlyoa.com/2014/06/12/serbian-journal-accepts-paper-in-24-hours-with-no-peer-review-demands-eur-1785/). Basically, the scientific community would like to know how you plan to be transparent about the academic activities of this journal in the future, but also how you plan to address the academic irregularities from the past. a) It appears as if no peer review has in fact taken place at ABS. It is unclear for which manuscripts, and for how long this might have been taking place. How can you prove that the papers let’s say from the past 3 years (2011-2014) have been peer reviewed, given the instant acceptance for a fee provided by your predecessor, Prof. Božidar Ćurčić? Would ABS be willing to provide the peer reviewers’ reports upon request for any paper in this period, or better yet, post all peer reports as an open access file for each paper published in this period? b) Will you formally retract any papers that have not been peer reviewed? This includes papers by Prof. Božidar Ćurčić, his son and daughter and other colleagues who are accused of nepotism. c) How will you address the manipulation of citations and self-citations that were used to boost your impact factor? Will those papers that manipulated reference lists be retracted? d) Between 2010 and 2014, there were numerous cases o plagiarism and self-plagiarism, some extremely serious. Will those papers be retracted? If those papers are not retracted, the message that will ultimately be sent is that ABs embraces, encourages and supports plagiarism, self-plagiarism and serious academic misconduct. e) How will you address the issue of predatory fees for no peer review, i.e., pay-for-publish model? f) Will you refund those authors who paid fees but had no academic input or peer review for their papers, including all papers that are apparently queued for publication until mid-2015? g) Will you inform all authors that published in ABS between 2010-2014 of these problems and your solutions? h) Please provide a timetable by which you plan to achieve these objectives, how you plan to address each of the 7 points listed above, and most importantly, who are the individuals who will be leading this effort and taking formal responsibility moving forward? I and the wider biological science community look forward to a formal response to these queries, to seeing these issues resolved, and to seeing a public disclosure of acceptance of these past and future responsibilities so that trust can be reclaimed and so that scientists can feel comfortable in submitting papers to ABS, confident in its ethical, transparent and academic posture. 1. The publisher of ABS, the Serbian Biological Society, held a specially convened meeting condemning unacceptable editorial practices of the Editorial Board. 2. The Editorial Board including EIC professor Curcic resigned under pressure. Professor Curcic also resigned from the position of the President of the Society. 3. The newly elected Editorial Board led by the new EIC made a decision about totally abandoning practice of charging authors for publication of articles and made the decision public through the new Instructions to Authors. 4. A delegation of the Publisher and Editorial Board held a private meeting with representatives of our centre (CEON/CEES) to consult with us about necessary steps to reestablish the practice of full respect for ethical standards in the future management of the journal. It was agreed upon that an inquiry about misconducts that led to public defamation of the journal is absolutely necessary and will be conducted. It was also agreed that journal will start using a system of journal online management to ensure better transparency of the editing in general and peer reviewing in particular. Based on all above, we strongly suggest that you withdraw the Archives of Biological Sciences from your List of Predatory Journals and support this way the new Editorial Board in its efforts to heal the journal. Update with verbatim e-mails (unedited, except for e-mail addresses, whihc have been deleted). NOTE: to all those contacted, any communication held before November 29, 2014 between me and ABS may be requested. I consider this to be a matter of public importance, and thus for maximum transparency, all documents that are available, can be provided. Thank you for that rapid rejection of the paper, within 24 hours. Even more so, after the expert opinion of three peers. I would be curious to know who those peers were that are expert in tissue culture of the Cycadaceae. I certainly could not find any experts on your editor board. Perhaps you would be so kind, while the information is still fresh in your mind, of indicating who the three experts were. My colleagues and I are quite happy to receive a valid and professional rejection, but we would like the proof. And, in such a case, the proof lies in the critique offered by the peer reviewers. You are right about the manuscript category. I did notice even short papers that are traditionally considered to be short communications are lumped together with large papers at ABS, e.g., Vol 66(4), page 1641. I should note that our manuscript was perfectly formatted to ABS, so in essence you have wasted our precious time with unscholarly and pedantic requests. I consider this, however, to be a very positive development since a rejection based on peer review within 24 hours is always better than an acceptance with an extortionary fee of 1785 EUR within the same time period. Considering that in fact, peer review at ABS is not blind or even double-blind would it be fair to say that my assumption is correct, or at least highly plausible, and that in fact, it is impossible to get a fair peer review at ABS, even if I wanted to, and even if the research was worthwhile, simply because there is now a permanent, engrained conflict of interest? Incidentally, we are almost 6 months after the “incident” with Prof. Božidar Ćurčić, the former EIC, yet, despite the serious claims of massive plagiarism, self-plagiarism, and gaming of the impact factor, I still notice that not a single erratum, expression of concern, or retraction (* except for a publisher-induced gaffe) appears for a single paper between 2010 and 2014 (http://archonline.bio.bg.ac.rs/). Isn’t that odd? How much time will you need to correct the academic fraud that has been published in your journal, Dr. Poznanović? 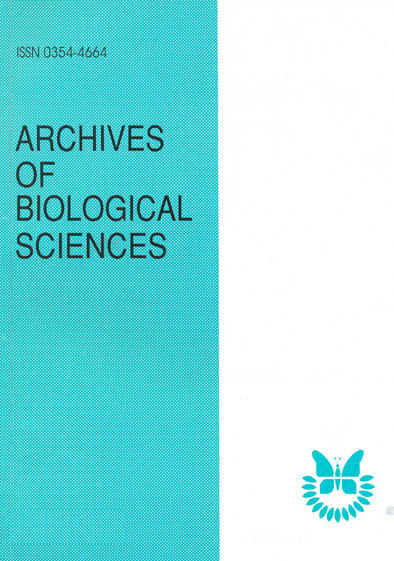 published in the ARCHIVES OF BIOLOGICAL SCIENCES, BELGRADE Vol. 66, No. 3, 2014 due to a printing error. The same paper has already been published in the ARCHIVES OF BIOLOGICAL SCIENCES, BELGRADE Vol. 66, No. 2, 2014 (DOI:10.2298/ABS1402683C). You have failed abysmally in keeping your promise, made on July 30, 2014, at 5:55 PM. And when will Thomson Reuters stop rewarding fraudulent and non-academic pseudo-scholarly journals like Archives of Biological Science that conduct fake-review rather than peer review, and that seem to enjoy maintaining corrupted literature that is filled with self-plagiarism and plagiarism? Does this say more about Serbia, about Abs, or about Thomson Reuters? Incidentally: JCR IF 2013 = 0.607 Not bad considering that there is a strong likelihood that no, weak, or fake peer review may have or continue to be taking place in your journal. Why does DOAJ continue to list your journal? Of course it is highly likely that neither you nor your band of pseudo-academics that have been put in place to defend the image of Serbia, will respond, and once again, I am forced to post my claims and concerns publically. May I advise, as a mere bleb of the plant science community, that you and your journal get your act together. Because unless you shape up this pseudo peer review, and unless you retract every single paper that was published in ABS that was accepted automatically without peer review, or that is filled with self-plagiarism or plagiarism, you will continue to inflict damage on the good name of Serbian scientists and on the image of your country, by being passive, and without demonstrating transparency. That suggests that you are employing contradictory and false double-standards, one for yourselves, and one fake one for your authorship. I look forward to submitting a manuscript in 2015. I will allow a few months to pass before I submit to allow for deeper reflection and a true reform to take place. I am confident that you will understand the importance of dealing with this issue immediately. thank You for suggestions and comments. We will inform of each step that is taken to address the issues You raised in Your letter. In light of recent events involving the Archives of Biological Sciences (ABS), Belgrade, at a meeting of the Serbian Biological Society on 17 July, 2014, the resignations of the President/Editor-in-Chief, Prof. Dr. Bozidar Curcic and members of the Editorial Board of the ABS were accepted. At the same meeting, the Society elected a new President and members of the Governing Board, Editor-in-Chief and Editorial Board of the ABS, as well as a new President of the Society. Members of the Serbian Biological Society expressed their unanimous expectation that the newly elected individuals strictly adhere to their commitment to uphold all the principles, ethical standards and good practice of scientific publishing. I felt uneasy to learn about your new troublesome issue with ABS. Please, let me know if you publish the paper rejected by ABS in some other peer-reviewed journal, since this would be a confirmation of your misgivings about ill intentions of ABS Editorial board. As you might know, ABS was suppressed from SCIndeks, the national citation index, we publish. Our decision was publicized (http://ceon.rs/index.php/en/88-vesti/315-archives-of-biological-sciences-suppressed-from-scindeks). The publisher, all co-publishers, as well as the Ministry of Science as financial supporter of ABS were called to take ordinary measures against publishing misconduct. As you know, at a particular moment I asked Jeffrey Beall to remove ABS form his List of predatory journals. However, this was just because the new editor and the representative of publishers firmly promised to distance themselves from the practices of the former editor, who was indulged in various misconduct, including citation manipulations. Instead, they continue to publish his papers massively. It seems that all they changed was abandoning author-pay model, although we insisted that this was not necessary as log as the author charges are real and fair. Recently the publisher urged us to lift our suppression, which we declined. We don’t intend to change our position unless ABS Editorial board fulfill all its obligations. The additional reason why we insist on this matter is that the Ministry of Education of Science of Serbia, along with its regulatory bodies failed to impose any sanctions against ABS and find out dissent way to close this affair. Sorry for the late response. I was ill and hospitalized for quit some time. On re-reading your mail and the controlled civility of my response, I have the following to add. The ABS is not interested in your instructions and observations, and even less in the implicit insults directed at the ABS, my colleague-reviewers and myself. Reserve your questions of our competence for the entities responsible and refrain from any further attempt to “enlighten” us with your coercive and bullying missives. Your paper simply was not accepted and how you deal with this is your business. As a professional, I am willing to consider your submissions in future, but under no condition will I condone further comment from you personally on any decision that is taken. I have not followed RW blog for some periods, and as a result I only read this amazing post and series of comments yesterday. I must say I find the whole affair very interesting, adding much light into clockwork behind scientific publishing. I would like to thank JATdS for all this and congratulate him for the initiative. I hope the increasing number of scientists and PhD-holders who are unhappy with the system will intensify such kind of exposure and pressure. An erratum appears in Volume 66, Issue 4 of 2014. It claims that a paper was duplicated, but does not retract the duplicated paper. Why not? Furthermore, no apology is offered to the readership. In fact, this erratum is a retraction, but is labelled in the retraction notice as an erratum, hence the confusion. Page 665 refers to data in Tables I and II. There are no tables in the paper. Where are the tables? a) Readers of ABS will never know that an incorrect version existed, unless ABS publishes an erratum, as well as a note alongside the new PDF file. How will ABS address this issue and indicate to the public that there were problems? b) The old PDF file indicated that the page numbers were 663-667 (a 5-page manuscript), but the new PDF file shows a 7-page manuscript, STILL labelled as pages 663-667, even though the actual PDF file shows clearly that pages run until page 669. On the issue web-page, ABS has also changed the page numbers to reflect page 669 as the final page, but the FIRST page of the next manuscript by Xi et al. indicates that the first page is page 669, which the PDF file also displays. c) The quality of the new PDF file is extremely poor: the figures are barely visible, unlike the high resolution images of the “old” PDF file, and the text cannot be copy-pasted as in the “old” PDF fie, which indicates that some “lock” has been placed, most likely to avoid detection by Google spiders. The EIC and the journal ABS must clarify how this very messy situation, particularly the inconsistencies in page numbers, overlapping page numbers and vastly reduced PDF quality, will be resolved. Please compare the PDF fies of the two following papers. Department of Biology, Faculty of Arts and Sciences, University of Çankırı Karatekin, Çankiri/Turkey. The EIC provides a response, and decision, in 24 hours. 1. Your claim that the paper Uranbey S. In vitro bulblet regeneration from immature embryos of endangered and endemic Muscari azureum. Arch Biol Sci. 2011;63(1):209-15 is a duplicate copy of Uranbey S. In vitro bulblet regeneration from immature embryos of Muscari azureum. Afr J Biotechnol. 2010;9(32):5121-5 is correct. Therefore, the Editor-in-Chief of the Archives of Biological Sciences has decided to retract the paper immediately. This retraction will be published Online First with a DOI number today and it will be included in ABS 67(3) since the preparation of issue 2 have already started. 2. This problem is more complicated. At the time when this issue of the ABS was published, the ABS was managed by a team which was responsible for several unethical breaches in scientific publishing. This team was changed in the summer of 2014 and since then a new team is addressing these issues. DoiSerbia, which is a service of the National Library of Serbia, represents all national scientific journals in CrossRef. It is the journals responsibility to inform DoiSerbia of any change regarding all published articles and contents of an issue. In this specific instance this rule was not adhered to. DoiSerbia initially obtained a PDF file of this article, which did not contain the said tables. When the editorial team of the ABS became aware of the omission of the tables, they changed the PDF files on the web site of the journal, provided an arbitrary DOI number, as well as published the issue with the corrected version of the paper without informing DoiSerbia. We were made aware of this problem after we received your email. We have informed DoiSerbia of this and together with DoiSerbia, we will address this problem. The new editorial team wishes to express its sincere apology to the scientific community for the mismanagement of scientific information. The new editorial team will correct all mistakes while striving to ensure accurate, timely, fair and ethical publication of scientific papers. Data in the tables of these two papers is being questioned at PubPeer. Batos B. 1, Z. Miletic 1, S. Orlovic 2, and D. Miljkovic 3 (2010) Variability of nutritive macroelements in peduncalate oak (Quercus robur L.) leaves in Serbia.- Genetika, Vol 42, No. 3, 435-453. The Editor-in-Chief has been informed that the results in Table 1 and in Table 2 presented in the article: Population variability and comparative analysis of macroelement concentrations in pedunculate oak (Quercus robur L.) Leaves and surrounding soils published in the Archives of Biological Sciences in 2014, Vol. 66, Issue 4 partially overlap with the results in Tables 1, 2, 3a and 3b, published in the article Batos B, Miletić Z, Orlović S, Miljković D. Variability of nutritive macroelements in pedunculate oak (Quercus robur L.) leaves in Serbia. Genetika. 2010;42(3):435-53, DOI: 10.2298/GENSR1003435B without proper cross-referencing. Queries about the origin of select figures in a 2014 ABS paper are being made at PubPeer. 1 Institute for Plant Protection and Environment, Teodora Drajzera, 9, PO Box 33-79 – 11040 – Belgrade – Republic of Serbia. 2 Galenika/Fitofarmacija, Batajniki drum b.b. – 11080 – Belgrade – Republic of Serbia. 3 Institute for Field and Vegetable Crops, Maksima Gorkog 30 – 21000 – Novi Sad – Republic of Serbia. 4 University of Novi Sad/Faculty of Agriculture, Dositeja Obradovia 8 – 21000 – Novi Sad – Republic of Serbia. [a] The Engineering and Research Center of Southwest Bio-Pharmaceutical Resources of National Education Ministry of China, Guizhou University, Guiyang 550025, China. [b] Guizhou Bioresource Development and Utilization Key Laboratory, Guizhou Normal College, Guiyang 550018, China. [c] Institute of Excellence in Fungal Research, School of Science, Mae Fah Luang University, Chiang Rai 57100, Thailand. Another retraction from ABS has been detected. Please compare these two PDFs. Please compare these two PDF files. Walaa Mohamaden, Heng Wang, Huawei Guan, Xia Meng, Jianji Li. Effect of potassium oxalate injection on serum and kidney tissue of beagle dogs. As it is in all of our interest to provide a correct and academic procedure for published papers, we are doing our best to solve this issue. Therefore, the editorial board is going to discuss further the situation regarding the paper. – This situation is to be notified to the institutions affiliated for each author, so that an official note will be acknowledged. We kindly ask you to consider that all papers are checked for plagiarism when accepted for peer review (in this case, July 2013). Is it impossible to detect papers that are not indexed at that moment, so we can only rely on the correctitude of authors on this. We will let you all know about our future decision. Please compare the two following PDF files. An apparently same photo shows very different things. A case that involves 6 papers, one of which is ABS, has emerged at PubPeer. Centre of Research for Development (CORD), University of Kashmir, Srinagar- 190006, Kashmir, India. Pakistan Journal of Biological Sciences 16: 976-983. 2013. Relation between physico-chemical limnology and crustacean community in Wular Lake of Kashmir Himalaya. 8 retractions in two consecutive ABS journal issues. Please compare figure 1 of the following two papers. 1Department of Lung Cancer Surgery, Tianjin Key Laboratory of Lung Cancer Metastasis and Tumor Microenviron¬ment, Tianjin Lung Cancer Institute, Tianjin Medical University General Hospital, Tianjin 300052, China; 2Col¬lege of Nursing, Tianjin Medical University, Tianjin 300070, China; 3College of Electrical Engineering, Chongqing University, Chongqing 400044, China. *Equal contributors. Indian J Pharmacol. 2013 Jul-Aug; 45(4): 359–364. The Journals of Gerontology, Series A Biological Sciences and Medical Sciences (2010) 65A (12): 1269-1274. Premature centromere division of metaphase chromosomes in peripheral blood lymphocytes of Alzheimer’s Disease patients: relation to gender and age. Compare Fig 3B of the 2010 paper and Fig 2 of the 2013 paper. Please compare the data in Tables 1 and 2 of both papers. Please examine the data across several tables in both papers. Please examine the following two papers. * Author to whom correspondence should be addressed. Another 8 retractions and 2 corrigenda are ligned up for the next issue of Archives of Biological Sciences. Another two corrigenda appear online first.